The waters around a coral reef are brimming with life. Not just with the bounty of fish, sea urchins, and anemones we see when we snorkel, but with innumerable unseen microbes in the waters surrounding them—a microbiome that is inextricably linked to the corals’ survival. Humans also have a microbiome. Our bodies contain at least as many microbes as they do human cells. In recent years, we’ve come to understand that that our health depends on these microbes and we can’t function without them. But, in contrast to the human microbiome, we know very little about the microbes that keep corals healthy. Though corals cover less than one percent of the seafloor, coral reefs support roughly a quarter of all ocean species. But reefs all over the world are struggling to cope with human impacts ranging from overfishing and pollution to changing ocean conditions caused by climate change. Weber is on the vanguard of researchers working to illuminate some of those links. She is investigating not only which microbes are present on a reef, but also what key organic chemicals those microbes might use and produce to keep the entire ecosystem functioning. This research could eventually lead to new ways to assess the health of a reef system. But first, scientists need to understand what the microbial community on a healthy reef is actually like. Off the southern coast of Cuba is a line of small islands and a flourishing reef system known as Jardines de la Reina—Gardens of the Queen. Since 1996, it has been a protected reserve where fishing, tourist activities, and coastal development have been strictly limited. 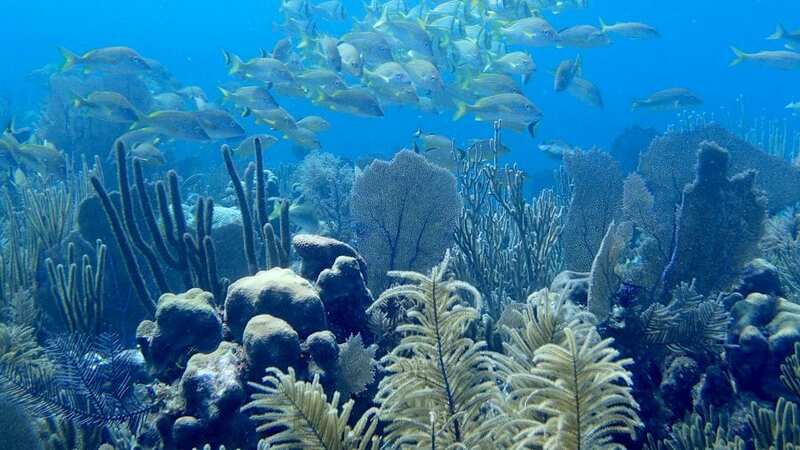 These restrictions have made it one of the least-impacted reefs in the Caribbean. It was the perfect place for Weber to collect samples from healthy reefs. Weber has been to Gardens of the Queen twice, first in 2015 and more recently in November of 2017. The second trip was aboard the Alucia, the first non-Cuban research vessel allowed to work in the area. 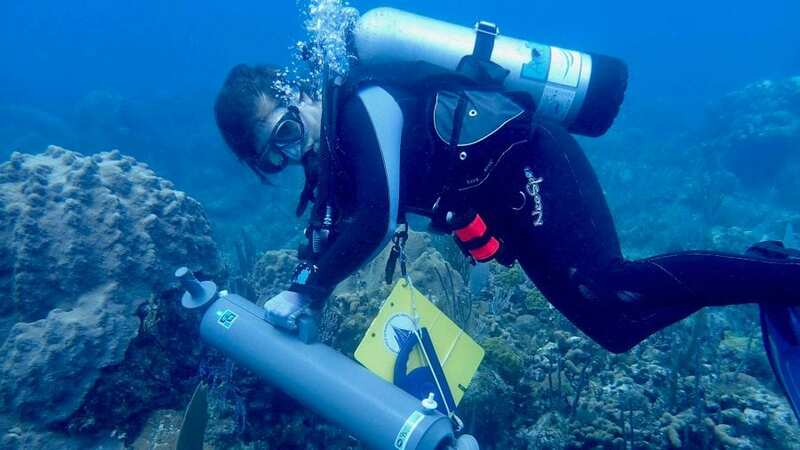 The expedition included scientists from the Woods Hole Oceanographic Institution (WHOI), the University of Havana, and multiple Cuban governmental organizations. 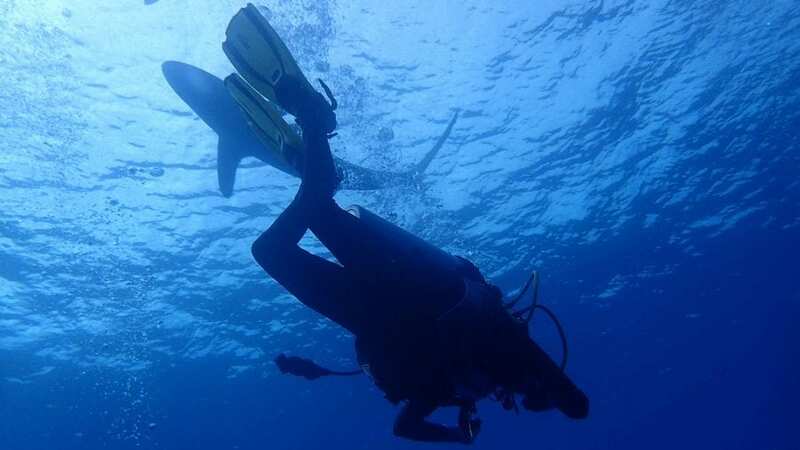 Over the three-week trip, the scientists surveyed the density and biodiversity of corals and fish on the reefs and collected samples of seawater. Weber brought these samples back to WHOI to analyze the microbial communities and organic molecules in the water. In the lab at WHOI, Weber started identifying the microbes in the samples she collected from the reefs. She then compared the DNA from the samples with a catalog of DNA from known species of bacteria to identify what species inhabited the Gardens of the Queen. But the information scientists can learn from genomics alone is limited. “We can identify the types of microbes which are present, but there’s not a lot known about what microbes do in reef water,” said Amy Apprill, a microbiologist at WHOI. Apprill is Weber’s Ph.D. advisor and led the most recent expedition to Gardens of the Queen. One way to reveal what the microbes are doing is to examine the chemical compounds that microbes produce and leave behind in the water. Different microbial activities create different chemicals, called metabolites. Some are waste products from metabolic processes. Some are produced to signal other microbes or to jump-start new biochemical reactions. In most cases, scientists can’t directly link these chemical compounds back to the microbe that made them. There are simply too many different microbes that could be responsible. What Weber is trying to do is identify common metabolites in reef seawater, and link these metabolites back to the processes that made them. Then she can infer which bacteria, based on their DNA, might be capable of performing those processes. Kujawinski is collaborating with Weber and Apprill on the project. Her expertise is in measuring infinitesimal amounts of the metabolites produced by microbes throughout the ocean. Weber is applying these same methods to coral reefs to try to decipher what the microbes have been up to. Between these two techniques, Weber is using her samples from the Gardens of the Queen to start to establish a baseline for what a healthy reef might look like at a microbial level. Growing up outside of Washington, D.C., Weber’s first interactions with coral reefs were through photographs, and of course, Disney’s The Little Mermaid. After snorkeling in Bermuda when she was 13, Weber knew she wanted to study coral reefs. But she had no idea she would end up focusing on the microscopic organisms that help keep those ecosystems healthy. She studied biology at the University of Maryland, conducting vegetation surveys at Mt. Saint Helens and sampling bacteria and fungi on salamander skin in a campus lab. But she finally had the opportunity to return to Bermuda in the fall of her senior year, for a semester abroad at the Bermuda Institute of Ocean Sciences. 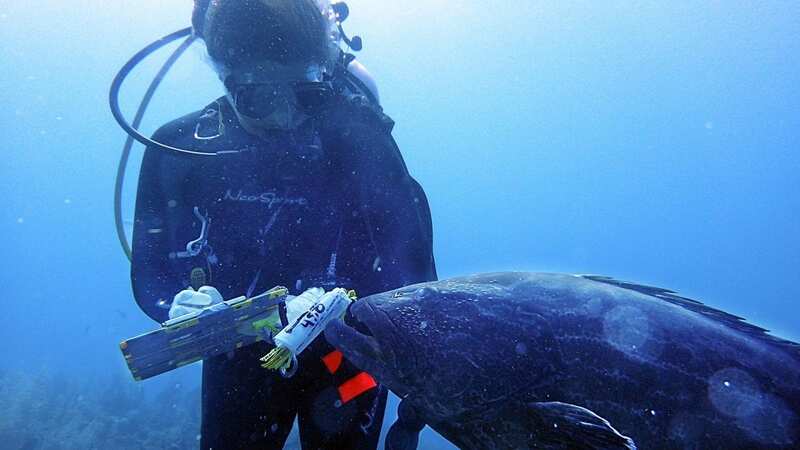 There, she took classes on coral reefs, collected underwater specimens, and worked with a seawater microbiologist who ultimately connected her with Apprill at WHOI. There are visible signs when a reef is struggling. Patches of coral bleach or die, algae become more prominent, and the types and quantities of fish and invertebrates able to live on the reef change. But what’s happening to the microbes? Weber hopes to decipher which microbial activities are important to coral reef health by looking for patterns in the metabolites and microbes across reefs facing different levels of human impact. 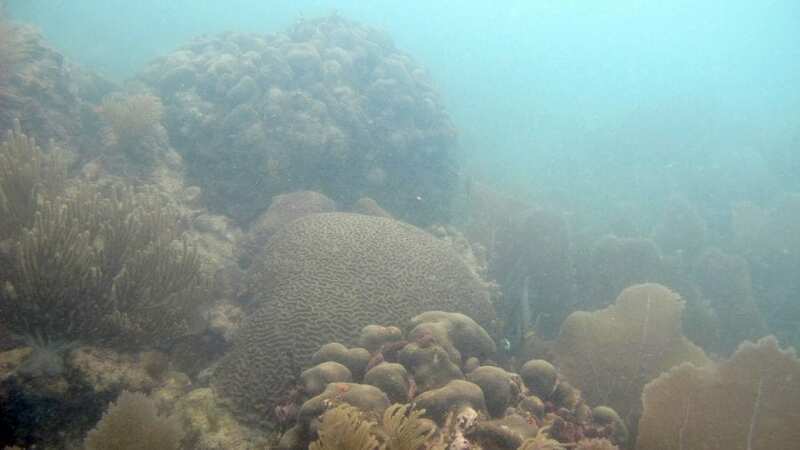 Weber and Apprill, and microbiologist Alyson Santoro from the University of California Santa Barbara, took a trip to the Florida Keys to collect samples from reefs that experience a much higher level of human activity than the Gardens of the Queen do. They quickly found correlations between the reef’s appearance and its microbiome. Photosynthetic microbes, like plants, get their energy from the sun. They’re not limited to using only the resources available in the water, as other species are. This influx of outside energy is likely to be part of the reason that a healthy coral reef can support so much life. There was also a greater variety of microbes in the healthier reefs. The team found more than 350 different species of microbes at Gardens of the Queen, compared to 150 to 200 in the Florida Keys. This matches up with what they’ve seen on the macro-level—healthy reefs support a higher diversity of species. These species have evolved to fill every niche on a reef—nothing is wasted. 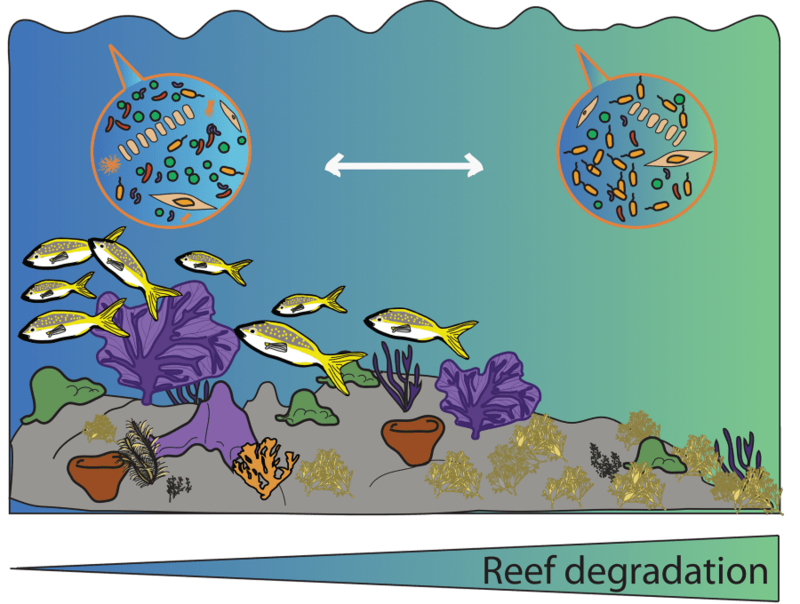 The healthier reefs have fewer nutrients in the water because anything discarded by one microbe is immediately recycled by another species. These trends are just beginning to shed light on the unseen world underlying coral health. Establishing a baseline of which microbes and metabolites are in a healthy reef “is really key to understanding what happens to a coral reef when it degrades,” Weber said. “There are so many discoveries,” she said. “But we’re still trying to get at the bigger picture. This research is funded by The Dalio Explore Fund.